China’s Property Market, Is it Going Up or Down? China’s real estate market is displaying two opposite extremes. In over 40 percent of large and medium-sized cities, the markets have dropped drastically or collapsed, while prices continue to climb in China’s largest cities. Media and experts are also split over what the future holds for China’s property market. In second-tier cities, real estate markets have been flat or dropping. According to the Chinese Bureau of Statistics, in November 2012, out of 70 large or medium sized cities, 41 have experienced price decreases for newly built commodity housing (excluding subsidized low-income housing). Wenzhou in Zhejiang Province took the lead with a 13.2 percent price drop. In the pre-owned housing market, 49 out of the 70 cities experienced a decline compared to November 2011, again with Wenzhou seeing the greatest decline of 9.9 percent. It has also been reported that in Ordos, Inner Mongolia, the housing market has collapsed. More than 80 percent of projects under construction have stopped. Housing prices also dropped from 20,000 yuan per square meter to just 3,000 yuan. In the meantime, media reported that the housing market in China’s first-tier cities, including Beijing, Shanghai, Guangzhou, and Shenzhen has recovered. Data from Centaline Property show that in the first half of December 2012, the transaction volume of new-construction units in Beijing went up by nearly 50 percent compared to previous months. Since the beginning of 2012, prices in popular neighborhoods surrounding Beijing increased on average by 20 percent, it said. In Shanghai, from Dec. 1 to Dec. 16, 2012, the transaction volume of newly built commodity housing reached the peak for the year, showing a 7.3 percent increase over the same period in November, and a 102 percent increase over the same period in 2011. In Guangzhou, on Dec. 19, 338 properties were on the market. In the proceeding month, prices on 56 of the 338 properties went up. 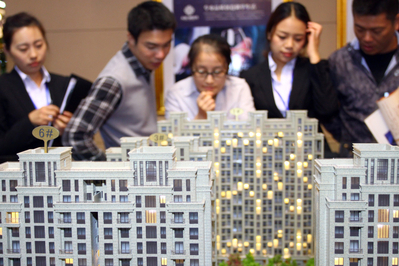 Chinese real estate experts are split on whether the price trend is going up or down. Ren Zhiqiang, an outspoken real estate tycoon and CEO of the Beijing Huayuan Group, has openly stated many times that real estate prices are definitely going up. He specifically predicted that housing prices would further climb in March 2013, a result of the housing supply being basically exhausted at that time. Qiu Xiaohua, director of the National Bureau of Statistics, said that real estate is a key industry in China’s acceleration of industrialization and urbanization. He therefore believes that housing price increases are inevitable, and the trend will continue for at least 10 years. Economist Andy Xie, on the other hand, recently predicted that real estate prices would drop by 50 percent in the next five years. He attributed the price drop to supply exceeding demand due to growing investment in home construction and slow population increase. Real estate expert Niu Dao also predicts that the Chinese housing market will definitely collapse and attributes the current recuperation of the market to Party officials colluding with institutions and individuals. On a Dec. 25 Sina blog, he said the officials sent signals to create the impression that home prices are on a rapid raise, in order to attract more home buyers. However, whoever buys now will end up losing money, Niu said. Chinese authorities have emphasized many times that they will not change their policy to curb the property market to return to “reasonable” housing prices. In fact, since the beginning of 2012, Chinese authorities reiterated their policy of curbing the housing market more than 210 times, according to Beijing Morning Post. Ren Zhiqiang, the Beijing Huayuan Group CEO, bashed Chinese authorities in a Dec. 14 article published on the website of Phoenix, the Hong Kong broadcaster, saying that in the last 10 years, every regulatory measure by the authorities was wrong. Ren said Chinese authorities still go by a planned economic model and constantly use administrative measures to manipulate the market. However, every regulatory measure the authorities have taken was wrong, because generally it only had a short-term aim but resulted in long-term side effects, which basically destroys the mechanism of a market economy. Only the market can adjust supply and demand, and result in reasonable housing prices, Ren said. Renowned economist Ye Tan is of the opinion that the 2013 housing market will rise steadily. She made two predictions in an article published on National Business Daily on Dec. 26, saying the market will continue to split in two extreme directions as it has been, and that authorities will reiterate that they have taken effective measures to tame the housing market despite the fact that prices continue to go up in a lot of areas. Ye said that, although Chinese authorities continue to tighten their control of the property market, it is the actual supply and demand and the economy that creates the driving force for housing prices to rise.